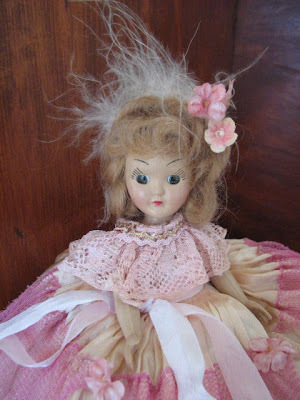 I have three small Duchess Doll Corp. dolls from the 1950s that have been patiently waiting for their make-overs. Yesterday I completed the work and today I managed to finish the pictures. A nice sunny day always makes for better pictures : ) These gals are all ready for Spring! 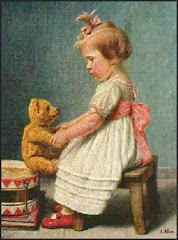 The first is a cute Brunette with a yellow, pink and blue gown. She has the sweetest face! I gave her hat feathers and vintage velvet pansies. 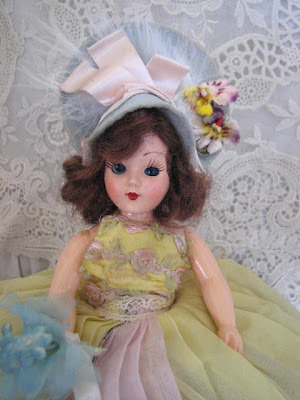 She now holds a pretty blue bouquet of tiny Millinery and vintage ribbon. 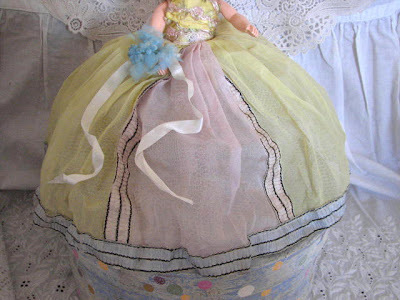 Her full crinoline makes her a true Southern Belle. 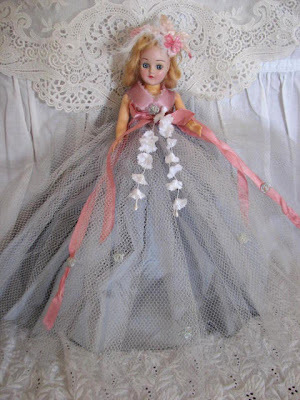 If you prefer pink and blue for your decor, this little doll is just the one for you! This Southern Belle is pretty in Pink. Her wispy feathers are original and the vintage flowers are my addition. Cider Update: We went to the Vet this morning to get Cider's stitches out. She still has to wear the cone for at least 2 weeks (possibly 4 weeks). There is one area where it just needs more time to heal. Very slowly it seems. She is always worn out after a trip to the Vet and certainly slept well this afternoon. She has a pretty pink bandage to show off ! Mummy Update: I almost fainted at the Vet today !!!! Seriously . . .this is not an early April Fools joke. I thought I was fine . . . just watching and talking while the surgeon removed stitches and cleaned the wound etc, etc. I guess I watched more than I should. All of sudden I realized I needed to sit down . . . immediately. I was soooooo embarrassed and white as a ghost apparently. The problem was we were in the "Procedure Room" and there were no chairs to be found any where. Luckily, Cider needs 4 Vet Techs to help with her so called "procedures ." One of the many technicians ran and got me a stool to sit on. This worked for a few minutes. Then I was relocated to a real chair and given some water. My poor dog had to carry on without me. 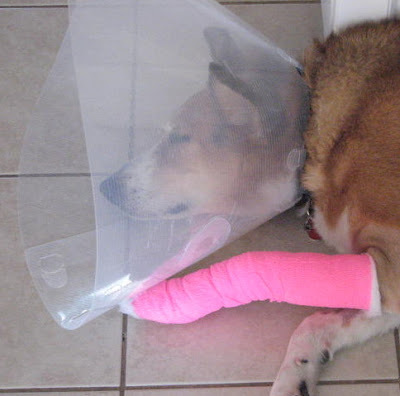 She was returned to me with a nice pink bandage and wagging her tail happily. I guess I will never be a Vet Tech. Aww....... I hope you are okay now? Love the little dolls! OMG Karen...Hope you are okay now. A little scary when you feel like that! Cider looks content...hope he recovers soon. If we ever get spring, the warm sun will help. 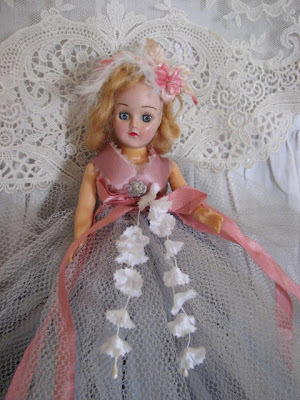 Love your dolls...very pretty. I think I like the blue one best. Poor baby, (cider, not you) LOL! I hope her leg heals faster with the new stuff. She's been through a lot! I guess our family would never have made doctors or even nurses *grin*! Sorry about your trip to the vet, but I can understand, I would probably be the same way. It's always worse when it is someone you love. Oh my, I am so sorry for my cackling laugh...it is just, that I am the same. I do not know how many times a well intended doc or vet will give me "too much information" and not realize my eyes are dilating, my lips numbing and my ears are ringing WHILE I am sitting. So glad Cider is doing well! It's so hard to see them recover sometimes! Lovely dolls. Sorry to hear about Cider but good that he is doing okay. I too had a mishap with my knee last week need x-rays this Monday.....yuk...not good for these kind of things.At least there is always someone at home who is the doctor!Take good care of Cider. Cider's a real trooper! Love the pink bandage! I'm sure you were having "sympathy emotion" for your sweet dog. Love your dolls. Love the southern belle! Bless her and your heart, she is just precious in that pink bandage! !